Assistant chefs provide a very vital link between chefs, head chefs and other staff members. Assistant chefs often share many of their responsibilities with chefs and may become chefs or head chefs in the future with conscientious and diligent work. What Is an Assistant Chef? Assistant chefs are usually highly trained individuals with three to five years of experience within the industry. An assistant chef works directly under either a chef or head chef to ensure that everything is done properly within the kitchen. The responsibilities of the assistant chef will often include ensuring that everything is prepped properly, ensuring that proper safety standards are kept within the kitchen and ensuring that the kitchen staff is scheduled properly. Assistant chefs will often be delegated tasks directly by the head chef, and so their responsibilities may include other items that the chef requires. Assistant chefs are usually highly trained individuals with three to five years of experience within the industry. Many assistant chefs are promoted from within. While a culinary arts degree is usually given preference within this field, it is not strictly necessary as long as the assistant chef has experience in the kitchen. What Does an Assistant Chef Do? An assistant chef may train new staff members and may help the preparation chefs in preparing for the food service. Assistant chefs will often move around the kitchen throughout their shift and aid the other chefs as is necessary. Most of the day-to-day tasks within the kitchen will fall upon the assistant chef if the head chef does not have enough time to cover it. The assistant chef may also help the head chef in creating a menu. At the end of the shift, the assistant chef will often need to ensure the cleanliness of the kitchen. This is usually done with the aid of the other staff members. After the kitchen has been inspected the assistant chef may also need to perform additional duties such as ensuring that everyone has clocked out and that everything is ready for the following day. How Do You Become an Assistant Chef? Most assistant chefs will have training in a culinary arts academy, but some assistant chefs will have on the job training and will have experience within the restaurant and dining industry. Assistant chefs need to be very goal-oriented and able to multi-task extremely well. Assistant chefs also need to have excellent people skills, as they often need to manage employees. Those that are eventually interested in becoming a chef or running their own kitchen will often need to become an assistant chef first. Assistant chefs need to have a comprehensive knowledge of all cooking techniques and flavors. Promotion within the culinary industry is often based as much on talent as it is on skill. Chefs that can impress with their cooking will usually acquire promotions at a faster rate than other culinary professionals. How Do You Advance as an Assistant Chef? An assistant chef will usually advance based on their experience and their reputation. 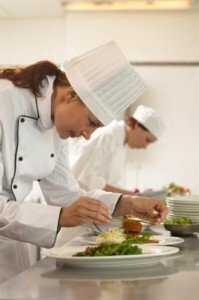 Many restaurants promote from within, so an assistant chef may be able to acquire a promotion through diligent and consistent work. Smaller restaurants may have only assistant chefs and head chefs while larger restaurants may have assistant chefs, chefs and head chefs. The Bureau of Labor Statistics reports that the area of special food services usually has a higher rate of pay than restaurants. Overall, those that are interested in advancing through the culinary arts will need to network properly and develop their skill over many years. Assistant chefs can also develop further by acquiring positions in different restaurants, such as restaurants that are more exclusive or restaurants that have different types of cuisine. The more versatile an assistant chef becomes, the more valuable they may be. An assistant chef can also consider becoming a private household cook, which according to O*Net Online has a faster level of growth than cooks in general.